A celebration in every slice! Two kinds of cookie dough, stuffed with three kinds of chocolate & colorful sprinkles, then drizzled with caramel & even more chocolate! 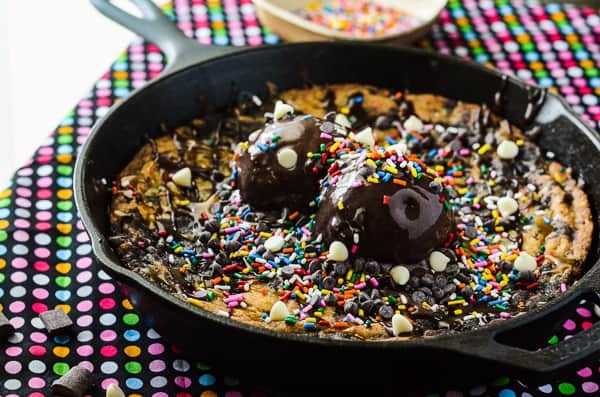 This Triple Chocolate Chunk Funfetti Skillet Cookie is probably the single most trashed-up thing on this blog yet. I won’t lie. It resembles kindergarten artwork hanging on the fridge. With maybe a dab of impressionism. And then a clown came over and sneezed on it. But, you know what? It was flippin’ scrumptious. Especially thanks to the melty double chocolate frozen yogurt on top, ohmigosh. Besides, it’s MY blogiversary, and I’ll use unnecessary amounts of sprinkles and chocolate chips if I want to. I see skillet cookies all over Pinterest all the time, but they’re always either regular chocolate chip, or double chocolate chip. Never both. Why not both??? Since I’m falling more and more in love with my cast iron masterpiece, I decided to use it to remedy the problem. I wanted a marbled skillet cookie. And now, you do, too. Don’t tell me that drizzle isn’t making you crave a slice of this thang. I think my favorite thing about food blogging is the photography aspect. Well, no, I guess the eating of the content is my favorite part. But photography is a very close second! When I started this blog a year ago, I had very little experience behind a fancy DSLR. Like, extremely little. Like, I still used kit lenses and shot in auto mode. I might as well have used my iPhone for the photography I actually did use it for at that point. Just like every other budding food blogger, I was a Pinterest addict, poring for hours over the gorgeous shots coming through my feed taken by Jessica, Sally, Dorothy, and Lindsay, among others. “How do they do it?” I used to ask myself. And then, one day, I tried it myself. Armed with my fancy camera, my notes on aperture and shutter speed, and a basic knowledge of Lightroom, I took on a duo of simple mini trifles that came to be by accident, and they ended up being my very first recipe on the blog. But, trust me when I say I can look back at every post I’ve done this past year and find a cringe-worthy flaw in at least one photo. I take comfort in knowing that every food blogger goes through the same thing as I do. I even smile a little when I notice an overexposed shot or over-sharpened closeup on another blog – it reminds me that no one is perfect; everyone has their bad days behind the lens. While I was doing research on food photography, well before I launched Crumby, one of the first resources I picked up was an eBook by Lindsay Ostrom of Pinch of Yum (one of my all-time fave blogs, for many reasons), Tasty Food Photography. Out of all the books and guides I’ve read, I can honestly say with all my heart that that’s the one that helped me the most. It’s easy to read, laid out well, and covers pretty much everything you could want to know about food photography. And anything you’re looking for that isn’t in the book? You can find at the Food Blogger Pro community. 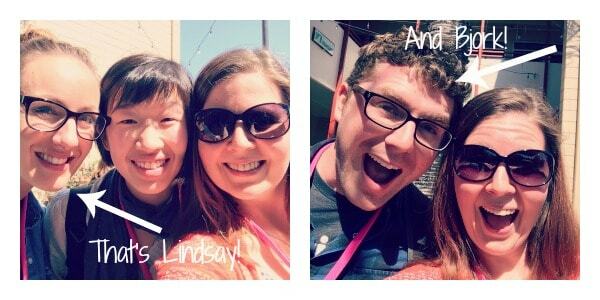 I was lucky enough to meet Lindsay (and her awesome hubby/assistant/tech guru/money-mastermind, Bjork) at the Food Blog Forum Orlando in February, and got to see and hear first hand about their adventures with PoY, both in panels as well as in person-to-person conversation. I was, admittedly, a bit starstruck. These two are stars in the food blogger world – they run a supremely successful, popular blog (that I can only hope to emulate to one day), yet are totally normal, grounded people who are just like everyone else. And that makes them that much more approachable, and easier to relate to. You can imagine my excitement when Lindsay gave me the green light for today’s giveaway – I’m so excited for whoever wins this great prize! 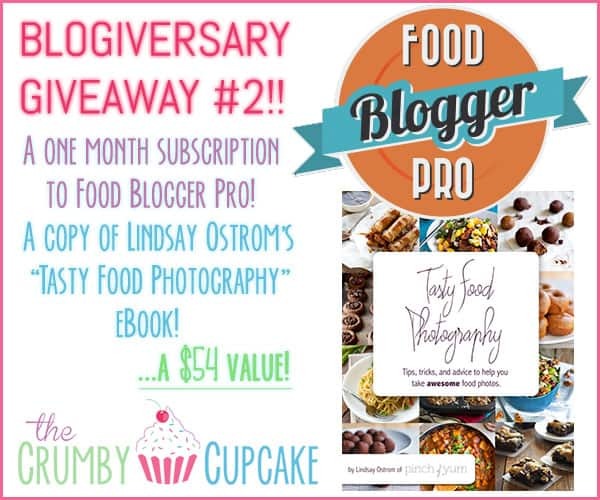 It may be one free month at Food Blogger Pro, but I promise you, you’ll stay for much longer. And the eBook is totally worth every penny! And this cookie is totally worth the calories, too! Make sure you load on the sprinkles! Preheat oven to 350 degrees F. Grease a 9-inch cast iron skillet with butter and set aside. Combine flour, cornstarch, baking soda, and salt in a medium bowl and whisk to combine; set aside. Using an electric mixer, cream butter and sugars together for about 2 minutes on medium speed, until light and fluffy. Add egg and vanilla, beating to combine. Add the dry ingredients to the butter mixture, beating on medium-low speed until JUST combined – do not overmix! Remove 1/2 of the cookie dough to a bowl, and add the cocoa powder to the remaining half. Continue to beat on medium-low speed for 30-40 seconds to blend cocoa powder. When dough is uniform, fold 1/3 cup of chips and half the sprinkles in to each dough flavor by hand with a rubber spatula. Turn the dough out into the greased skillet in four separate sections, pressing it in to an even layer. Leave a 1/2-inch border between the cookie and the edge of the skillet, which will give it room to expand so it doesn’t climb up the sides. Bake for 16-18 minutes, until a toothpick inserted in the center comes out clean. 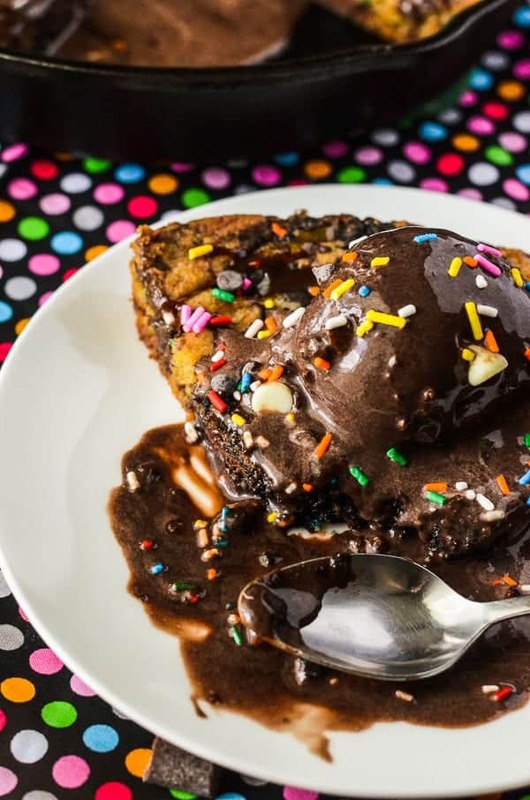 Give it at least 5 minutes to cool before digging in, but when you’re ready to serve, top it with your favorite chocolate ice cream, caramel and chocolate sauce, more chocolate chips, and extra sprinkles! Enjoy! What’s the craziest cake you’ve ever made for a party or celebration? Today’s giveaway is graciously sponsored by the sweet Ostrom’s of Pinch of Yum! This is downright sinful and I really want a piece for breakfast. Pinned. Happy anniversary too! This cookie is ridiculous and delicious! There are never too many sprinkles when you are celebrating a blogiversary (or, say, a Tuesday) – just ask my eight year old who puts them on her Cheerios to make them “happier”. Happy Blogiversary to you and I wish you continued growth and success as you continue to perfect your craft and become the food blog rockstar that everyone else wants to meet! My ultimate favorite food is dark chocolate! My favorite food of all time is a good old-fashioned grilled burger! Happy blogiversary! 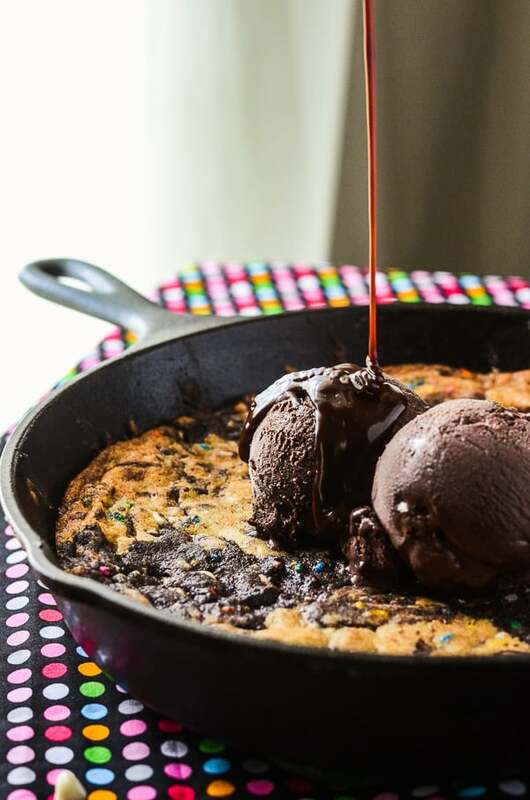 You really have major skills in food photography, because that cast iron cookie looks out of this world. I’d better check out that eBook. Thanks for the recipe! I don’t care if it looks trashed-up. It looks crazy and gooey, but it looks absolutely delicious and I can’t wait to make this for my family. I am bookmarking this. My kids will surely love this. Happy Blogiversary! 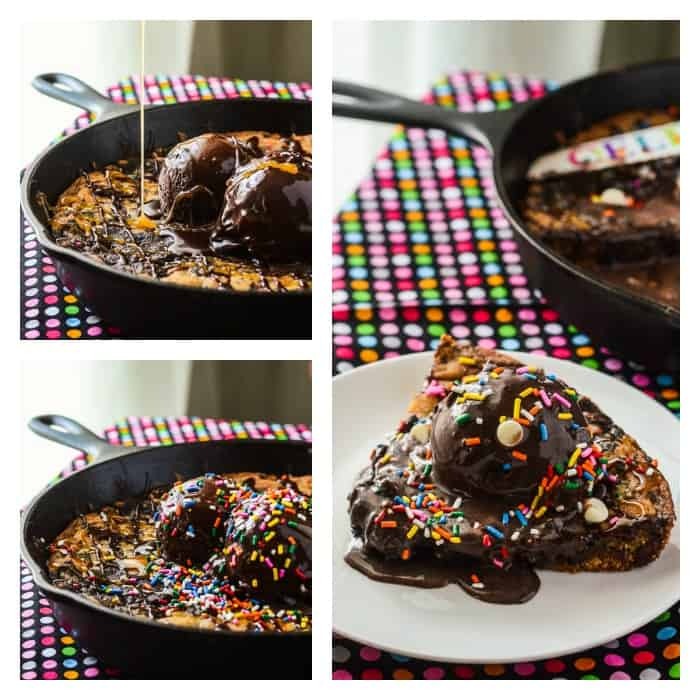 I can’t say that I have ever seen a recipe for a skillet cookie but I’m going to have to try one out now! It looks so delicious my mouth is salivating just looking at your wonderful pictures. I love the fact that you mixed two cookie doughs together as well. Haha! Loved your descriptions of how this looks! I think it looks amazing, and fun to see your chocolate option instead of the usual vanilla/white. Love it! Wow this looks amazing! Also it is clear as you said that one of your favourite aspects is photography as your pictures are amazing! P.s. I love your header design, so creative! This is one of the desserts that I could make, set it in front of me and eat myself sick but not regret one little bite! This is wonderful! Happy Blogiversary! Chocolate chips, Chocolate ice cream, I swear that this is a chocolate addicts dream!!!! I will have to try this recipe out myself, but I think I will add vanilla ice cream to balance it a little. Thank you for sharing, great pictures. 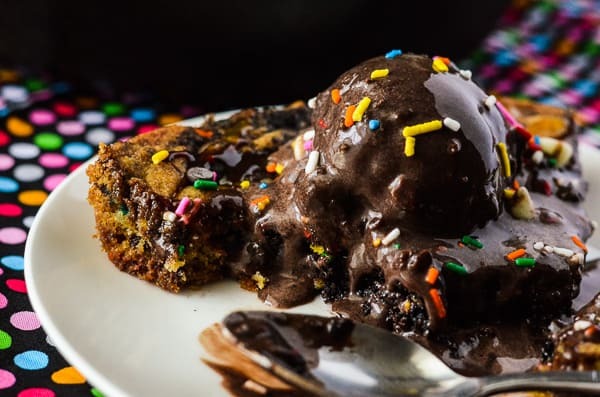 There’s no way someone could turn down a bite of this amazing dessert! This looks absolutely sinfully delicious and I love the ingenuity of it all, happy blogavesary and wishing you years to come. I am celebrating mine today. I think the clown that sneezed on your cookie can come sneeze on a cookie at my house! 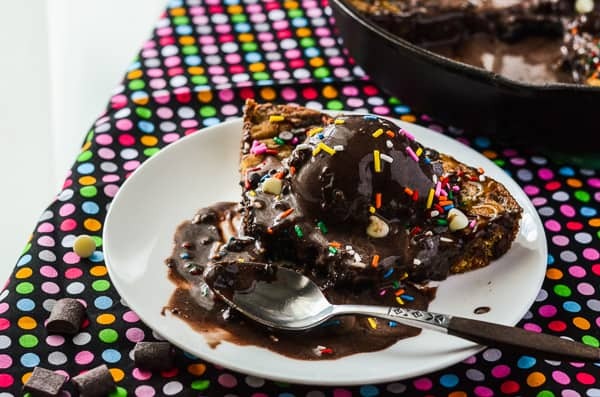 This looks amazing; I have such a sweet tooth and would love this dessert! Congrats on the anniversary of your blog and great giveaway! Happy Blog anniversary Erica and what a great milestone! I wish you lots of continued success! 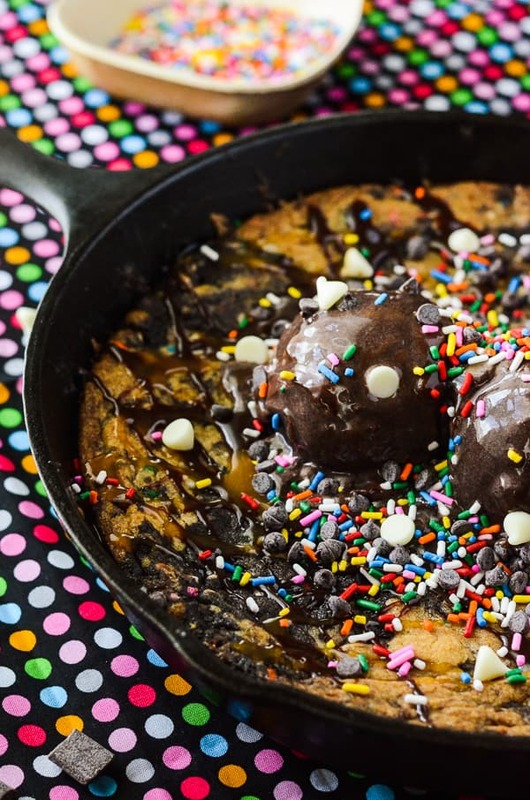 I have always wanted to make a fun cookie in a skillet! Yours looks like heaps of fun and something I would like to enjoy with my coffee right now! “And then a clown came over and sneezed on it.” Bwahahahahahaa…. *takes breath* bwahahahaaa!!! Hysterical! Andplusalso…what an amazing giveaway!!!! Oh geez, I’m getting heart palpitations just looking at this! It looks amazing, and your photography is great too (coming from a fellow photographer)! My favourite food is pizza. I could eat it everyday!